Ms. Patil was flanked by Defense Minister A.K. Antony, Chief Minister V.S. Achuthanandan, and Union Minister of State for External Affairs E. Ahamed, Leader of the Opposition Oommen Chandy, Congress legislature party secretary Thiruvanchoor Radhakrishnan, KPCC president Ramesh Chennithala and AICC general secretary Veerappa Moily. 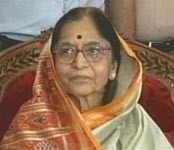 Earlier, Ms. Patil arrived by a special executive jet from Chennai. The senior UDF and LDF leaders received Ms. Patil at the airport.